JREV Now! 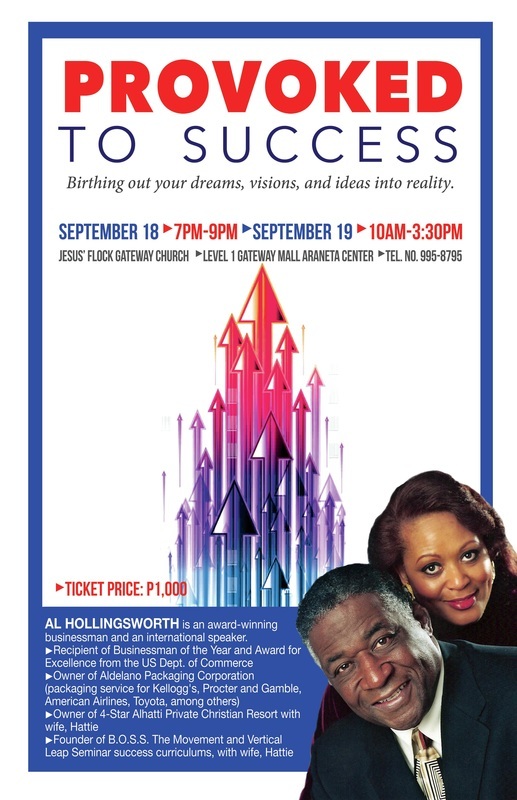 Foundation Inc. (JREV) will be hosting a conference with power couple Coach Al Hollingsworth and Hattie Hollingsworth, international business leaders and influential ministers of the gospel. We believe that they, through their amazing testimony, have the power to inspire the hearts of today’s generation and speak life to the new breed of individuals who are involved with JREV, just as how they have inspired you through their past seminars and talks back then. This conference will be from September 18 (7:00pm-9:00pm) to September 19 (10:00am-3:30pm). Al Hollingsworth wears many hats. He is a wealthy business leader, international speaker, minister of the Gospel and owner of the award-winning Aldelano Packaging Corporation, a national leader in the product packaging business for almost 50 years, serving big-time clients including Kellogg’s, Procter & Gamble, Sunny Delight, American Airlines, Toyota, General Mills, Red Bull and Verizon to name a few. Al and along with his wife Hattie Hollingsworth are founders of the Alhatti Private Christian Resort, a four-star vacation and retreat facility located in California, in the mountains above Palm Springs. But his success story doesn't stop in the field of business, Al and Hattie Hollingsworth are the even founders of the internationally-acclaimed, Christ-centered B.O.S.S. The Movement youth success training curriculum and its adult success training component (that's Biblically-based) known as the Vertical Leap Seminar that has been embraced throughout the U.S. and around the world in regions such as Japan, Kenya, South Africa, Switzerland, Ghana, Jamaica, Italy, Ukraine, Brazil, Belgium, Philippines, Indonesia, and the Bahamas among many others – and have trained thousands on market place ministry ethics and application. His success story extends to all his other ministry involvements that include Board of Directors for Promise Keepers, Board of Directors of Save Africa’s Children, Ministry Council Member of Empowered 21, Weiner Ministries, the ORU Board of Regents with special appearances on TBN, CBN, Day Star, PTL and more. BUY YOUR TICKETS NOW! Limited slots only!